MASSEY FERGUSON 35 35X TRACTOR CHROME LINER ENGINE REBUILD KIT (CD BUILD). Cylinder Block - Engine Overhaul Kit (Chrome Liner) to suit Massey Ferguson agricultural applications fitted with A3.152 engines. 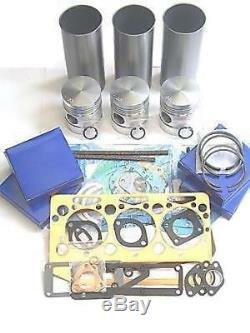 3 x Piston Liner Kit (Piston, Rings, Pin, Clips, Chrome Liner). 1 x Head Gasket Set (Copper Head Gasket). 1 x Bottom Gasket Set. 1 x Front Crank Seal. 1 x Rear Crank Seal. Excludes Scottish Isles, Highlands & Northern Lowlands, Northern Ireland, Channel Islands, Isle of Wight & Isle of Man. Founded in the UK in 2005, part of an expanding and fast growing international group established in the USA who have a long established formidable reputation for providing a wide range of engine parts to rebuild sand service the worlds fines working diesel engines. Engine Fix UK management and engineering staff have over 100 years accumulated knowledge of working within the OEM and aftermarket engine parts market supplying both Service Part OEMs, National Distributors and Engine Rebuilders, our retail arm is also available to sell to hobbyists and individuals. Engine Fix UK - The Products. Our product portfolio offers an exhaustive range of the following. Engine Rebuild Kits including Pistons, Liners, Rings, Gaskets and Bearings, Drive Line and Valve Train parts. For the following range of engines & vehicles. Engine Fix UK - ebusiness Customers. Engine Fix UK - Technical Excellence. Our engineering and manufacturing knowledge on Rotating and Reciprocating assemblies and components is second to none, when you fit Engine Fix UK parts they are the parts you can trust. The company has a specialist design and development capability utilising the latest CAD and 3-d modelling software package which enables reverse engineering to develop new parts to support our ever expanding range and client base. Engine Fix UK - The Supply Proposition. Our ability is to develop, manufacture, source and distribute the parts that are difficult to manufacture and deliver at a competitive price and ease of availability. The majority of our range is manufactured within our own joint venture factories and our global purchasing experience has enabled us to develop strategic alliances with a very select group of technically capable specialist engineering companies approved to TS16949/ISO9001/QS9000 quality accreditation. All our products are designed and developed to our own engineering drawings and standards. Our aim is to provide a bespoke solution for our customer, made and supplied to the highest market standard. We are also able to provide the engine specialist the necessary dimensional information to help identify your engine make and model together with any technical information required when rebuilding the engine such as valve clearances, bolt torque setting etc. Engine Fix UK - Quality Assurance. Our QA requirements ensure that all our products are manufactured within a TS16949 environment using modern production, test and measurement equipment with constant monitoring of dimensional features. All products are fully tested and approved with engine installation and are part of a full APQP an PPAP approval process. Our product reliability is assured by 100% functional testing of all our pumps and dimensional and material quality assurance on all component parts. Engine Fix UK - The Range. Our range is comprehensive covering Light and Heavy Commercial Truck & Bus, Off Highway, Agricultural, Industrial, Marine and Power Generation supporting engines in the range of 2 litres to 65 litres. Our range specialises in the support of engines of older vintage back to the 1940s as well as offering new engine parts for the modern day fuel efficient emissions friendly engines. Engine Fix UK - The Guarantee. Our product quality is assured at each stage of manufacturing, assembly and final test. Our process capabilities ensure consistency of production. Cheshire Depot: Power Source Engine Parts Ltd Freshfield Cassia Green Marton Cheshire CW7 2PZ West Midlands Depot: Power Source Engine Parts Ltd Unit 3, Woden Road South Off Bridge Street Wednesbury West Midlands WS10 0BP. Goods shall be deemed as any materials or parts supplied to the customer. Specifications The specifications of the goods shall be those stated in the Companys current catalogue. Whilst specifications are considered to be correct at date of printing, the Company reserves the right to change specifications of the goods and their packing and presentation without prior notification. If your order contains a fault/error or is incomplete Engine Fix UK must be notified directly within 48 hours of receiving the order. Business Address Freshfield, Cassia Green, Marton, Winsford, Cheshire CW7 2PZ, United Kingdom. Unit 3, Woden Road South, Off Bridge Street, Wednesbury, West Midlands WS10 0BP, United Kingdom. Prices We reserve the right to alter prices at any time without prior notification. Orders that are not completed through the checkout system within 7 days will be deleted from the system. Bank Transfer All payments received must match the Invoice total. Any costs charged by the paying Bank must be paid by the customer. Please put Order Number in as a Reference/Message. Cheques All Cheques must be paid in Pounds Sterling & payable to Power Source Engine Parts Ltd. Please write Order Reference number on the back of the cheque. Customers whose parcels have not arrived in this period should notify Engine Fix UK. Retention of Title and Risk Goods are the responsibility of the customer as soon as they are delivered by the company, its agent, to the customer. Goods shall remain the complete property of the company as legal and equitable owner until such time as the customer shall have paid the full price. Until such payments are made the customer acknowledges that he is in possession of goods as bailee of the company. Until customer becomes owner of the goods he is to store them separately from his own or those of any person in a manner identifiable, safe and conditioned. The Customers right to possession shall cease if they, not being a company, commits an available act of Bankruptcy or if they, being a company does anything or fails to do anything which would entitle any person to prevent a petition for winding up. The Company may for the purpose of recovery enter upon the premises where they are stored or where they are reasonably believed to be stored and may repossess the same. The Customer shall be at liberty to agree to sell on the goods on the express condition that such an agreement to sell shall take place as bailees for the Company, whether the customer sells on his own account or not and that the proceeds thereof are held in trust for the Company and at all times are identifiable as such. Such delay shall constitute a breach or repudiation of the contract. If the Company fails to comply with such obligations its liability for such failure shall be limited to the contract price of the goods. All parts are only to be fitted by competent persons. The Company shall not be liable for loss, injury or any damage relating to the parts supplied by ourselves. The express terms of these Conditions of Sale are in lieu of all warranties, conditions, terms, undertakings, and obligations implied by statute, common law, custom trade usage, course or dealing or otherwise, all of which are hereby excluded to the fullest extent permitted by law. The United Nations Convention on Contracts for the International Sale of Goods (Vienna 1980) shall not apply to orders for goods. Recycling & Packing Policy At Engine Fix UK our packing policy is to try to recycle and re-use as much incoming packaging as possible on the inside of our outgoing parcels to help reduce the carbon footprint on each of our sales items. We use the very best quality packing materials and pack to the highest standard to protect the contents on their, sometimes very long journey. Telephone numbers will be passed on as requested by most couriers and always when outside the UK mainland. Construction These conditions of Sale shall be subject to and shall be construed in accordance with English Law and the High Court of Justice in London shall have non-exclusive jurisdiction over nay dispute which may arise herunder unless the parties agree otherwise in writing. NOTHING CONTAINED HEREIN SHALL EFFECT THE STATUTORY RIGHTS OF THE CONSUMER. Any redistribution or reproduction of part or all of the contents in any form is prohibited. You may not, except with our express written permission, distribute or commercially exploit the content. Nor may you transmit it or store it in any other form of electronic retrieval system. Any reliance you place on such information is strictly at your own risk. However, Engine Fix UK takes no responsibility for, and will not be liable for, the bay store being temporarily unavailable due to technical issues beyond our control. JCB 3C 3CX 3D WATER PUMP U5MW0104 02101786. PERKINS PHASER 4 & 6 CYL JCB WATER PUMP 4131E011 U5MW0160 02/201457 332/H0893. MASSEY FERGUSON, BMC, FORD, DAVID BROWN TRACTOR TOOL BOX. MASSEY FERGUSON 30 40B 50 65 155 158 165 260 302.. ADD OUR STORE TO YOUR FAVOURITES & SIGN UP TO OUR NEWSLETTER TO RECEIVE IMPORTANT UPDATES, NEWS AND INFORMATION SIGN UP NOW! UNIT 3, WODEN ROAD SOUTH, WEDNESBURY, WEST MIDLANDS, WS10 0BP. The item "MASSEY FERGUSON 35 35X TRACTOR CHROME LINER ENGINE REBUILD KIT (CD BUILD)" is in sale since Friday, September 30, 2011. This item is in the category "Business, Office & Industrial\Agriculture/Farming\Tractor Parts\Antique Tractor Parts & Accs". The seller is "enginefixuk" and is located in GB. This item can be shipped worldwide.